When Tab Hunter was in Houston last summer for the QFest screening of Tab Hunter Confidential at the Museum of Fine Arts, Houston, I was fortunate enough to be included among the invitees at a private brunch where the semi-retired '50s heartthrob was the guest of honor. We chatted about various aspects of his stage and screen career, including his co-starring stint apposite Tallulah Bankhead in the ill-starred 1964 Broadway production of Tennessee Williams' The Milk Train Doesn't Stop Here Anymore (a play eventually filmed in 1968 by director Joseph Losey as Boom!, an equally ill-starred Richard Burton-Elizabeth Taylor vehicle). The production was a resounding flop, but Hunter continues to speak highly, and respectfully, of its director, the late Tony Richardson. "Just when it seemed I might never make another movie, Tony Richardson came to the rescue. He'd been hired to adapt Evelyn Waugh's black comedy [novel] about the mortuary business, The Loved One, He stocked the cast with stars in cameo roles. Mine was only two days' work, playing a cemetery tour guide. "How oddly fitting, considering that my movie career was dead." Unfortunately, Hunter had to wait a few years -- until 1981, when John Waters cast him opposite Divine in Polyester -- before he made anything resembling a movie comeback. 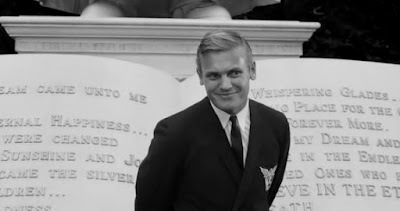 The Loved One, aptly advertised as "The motion picture with something to offend everyone," was roasted by critics and ignored by moviegoers during its initial theatrical run in 1965, and did precious little for the careers of Robert Morse, Rod Steiger and everyone else involved. But when I first saw The Loved One, when I was around 13 years old, I thought it was absolutely hilarious. (Yeah, I was a weird kid.) Subsequent reviewings during my adulthood have only reinforced my original impression that it was a movie way ahead of its time. (Steiger, it should be noted, seemed genuinely amused years ago when I told him during an interview how much I enjoyed his performance as Mr. Joyboy, a flamboyant mortician with mother issues.) Indeed, I am pleased to see that The Loved One has gained an admiring cult following over the years, and is periodically screened in classy venues like... well, the Museum of Fine Arts, Houston, where it will be presented at 7 pm. Monday, Oct. 26. Take a look at the trailer, and tell me, honestly: How could you possibly not want to see this one? 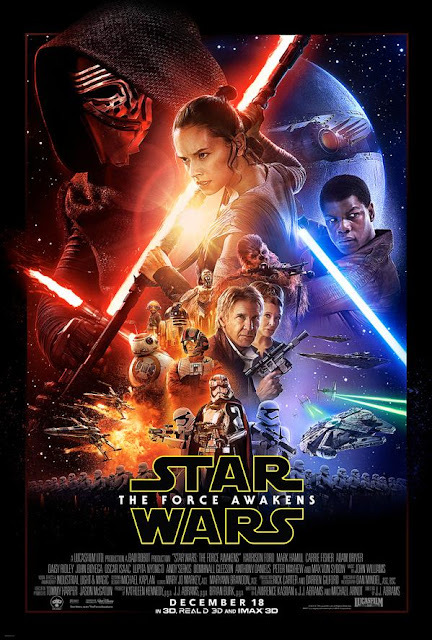 I just went on line to purchase my luxury-reclining-chair tickets for a Dec. 18 opening-night 3D screening of Star Wars: The Force Awakens at the Houston iPic Theater. Because that's how I roll. BTW: In the highly unlikely event you haven't already seen it, here's the trailer. Here's the poster for the new Star Wars movie and... Wait! Where the hell is Mark Hamill? Is he the dude in the funny helmet next to Harrison Ford and just below R2-D2 and C-3PO? Damned if I know. 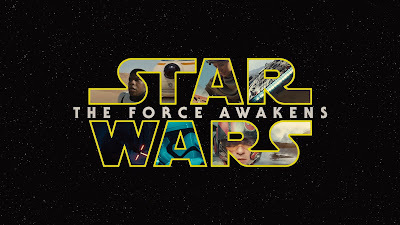 But I can tell you that tickets go on sale for the eagerly awaited (yes, even by me) Star Wars: The Force Awakens (or Star Wars VII, or whatever they've going to wind up actually calling it) Monday at the classy new iPic Theater here in Houston, and presumably at other theaters and drive-ins here and everywhere else it's set to open Dec. 18. Now where did I put my Visa card? But wait, there's more: A new trailer is supposed to be unveiled during tomorrow's Monday Night Football matchup between the New York Giants and the Philadelphia Eagles on ESPN. Funnily enough, that's right around the time I will be screening Casablanca for my Art of Filmmaking students at Houston Community College. Looks like I better set my DVR right now. Ed Lauter passed away two years ago today -- but I still keep his last voice mail message to me on my cellphone. Mind you, I don't listen to it very often, for fear I will do something clumsy and stupid and wind up erasing it. But I must confess: I do occasionally listen, just to enjoy the sheer enthusiasm in his voice as he expressed his hope "to be lifting a glass" with me "sometime soon" after I introduced him and Edward Burns' The Fitzgerald Family Christmas at the 2012 Starz Denver Film Festival. 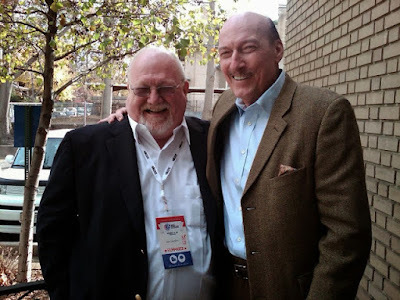 Among the most pleasant experiences I have enjoyed in recent years was a long, leisurely lunch with Ed Lauter, one of my all-time-favorite character actors, last November at the Starz Denver Film Festival. For the better part of two hours before we engaged in an on-stage, post-screening Q&A after the Denver Fest premiere of Ed Burns' delightful The Fitzgerald Family Christmas, we chatted about the highlights of our respective careers -- and he was graciously polite enough to indicate he found my anecdotes almost as interesting as his. Mind you, it wasn't like we were in any sort of "Can you top this?" competition. Because, really, what could I possibly say that could top his account of being cast by Alfred Hitchcock in Family Plot after The Master of Suspense spotted him in The Longest Yard ? Lauter impressed Hitchcock so much that he was set to co-star in The Short Night, Hitchcock's next film -- the film, alas, Hitchcock didn't live to make. 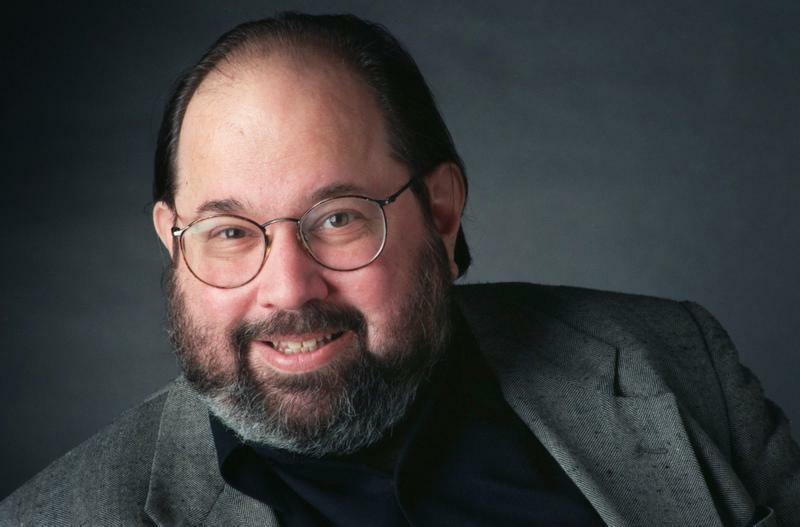 Lauter passed away Wednesday at age 74, leaving behind a body of work that ranges from The Magnificent Seven Ride! (1972) and French Connection II (1975) to The Artist (2011) and Trouble With the Curve (2012). "When I first started out,” he said in Denver, “I always thought, ‘Oh, I want to work with this great actor, or that great director.’ All these wonderful dinosaurs. Well, now I’ve become one of those dinosaurs, I guess.” I would be a liar if I didn't admit I felt immensely flattered when he told me that, because I'd singled him out for special praise in my Variety review of Fitzgerald Family Christmas, I'd helped get him "back in the game." I just wish he'd stuck around to play a little longer. "Every once in a while, somebody will come in here – and you’ll see that you like ‘em right away. Because they’re decent, and just good people. So give ‘em a drink out of this bottle. It doesn’t matter whether they have money or not. Tell 'em the drink’s on Manny Quinlan. Maybe they’ll remember him. If you feel like it, tell 'em he was a friend of mine." The bartender readily agrees, but asks: "What’ll I do when the bottle runs out?" "Nothing," Harry wistfully responds, clinking his glass in a toast against the side of the bottle. "Nobody lives forever." First there was King Kong vs. Godzilla. 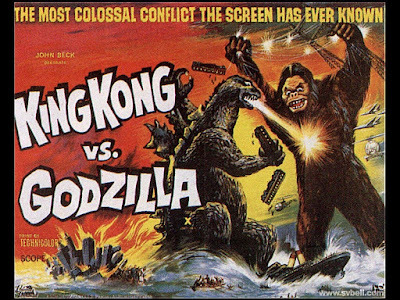 Now... Godzilla vs. Kong? I have no idea why they've changed the billing for the new flick, Godzilla vs. Kong, which was announced today as a project set for 2020 release. (Wow! Just five years to wait!) But I have to ask myself: Can the new and presumably improved (as far as special effects go) monster mash be anywhere near as entertaining as the original 1963 mega-smackdown? When I landed a gig as all-purpose writer/critic for the arts and entertainment department of The Dallas Morning News in 1979, Philip Wuntch already was comfortably ensconced as the paper's film critic. Of course, I wanted his job. 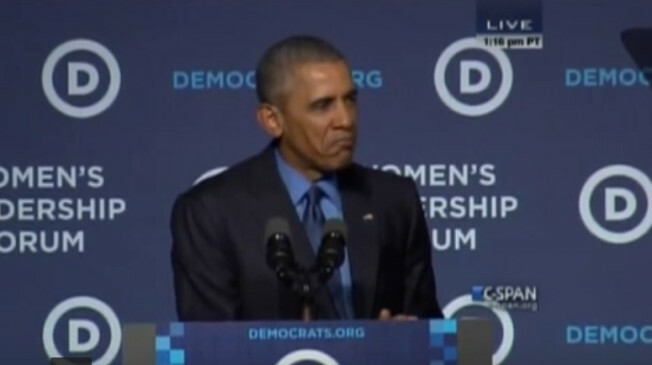 And, of course, he knew it. But here's the thing: Philip -- who passed away Monday at age 70 -- was so comfortable and confidant in his position, and with ample reason, that he viewed me not so much as a rival as a resource. And so he was impossibly decent to me, encouraging me to serve more or less as his backup -- when I wasn't busy backing up the theater critic, the TV critic, the dance critic, etc. -- by allowing me to review the movies he had neither time nor interest to review. This meant that, while he concentrated on the major releases by the big studios -- and wrote, among many other memorable pieces, one of the very best reviews of Raging Bull I recall reading during that classic's initial theatrical run -- I got to review the B-movies and exploitation flix at one extreme, and documentaries and other art-house fare at the other. Seriously: It was not uncommon for me to review, say, the original Friday the 13th and then, just a few days later. cover the latest Ingmar Bergman opus. I am not absolutely sure about this, but I think that because of Philip's laissez-faire attitude, my review of Francois Truffaut's The Green Room got bigger play in the Morning News than any other U.S. critic got for his or her review back in the day. In short: Philip -- who was film critic at the Morning News for a staggering 37 years -- is one of the handful of people I can thank for my having any kind of career as a film critic. And I would like to think he was so kind to me, so supportive of me, because he recognized in me someone who loved movies as much as he did. And trust me: He loved movies. A lot. To pay him the highest compliment I can imagine: He left this world a more entertaining place than it might have been without him in it.